View on GitHub Download for free! 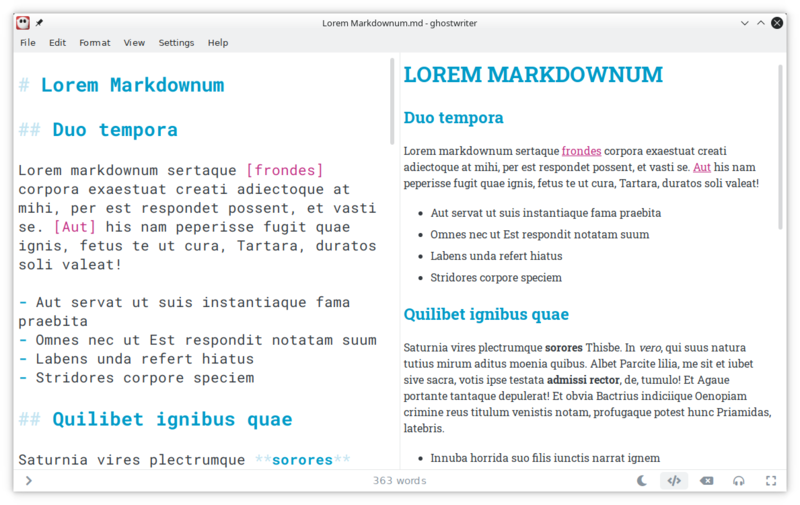 Enjoy a distraction-free writing experience, including a full screen mode and a clean interface. 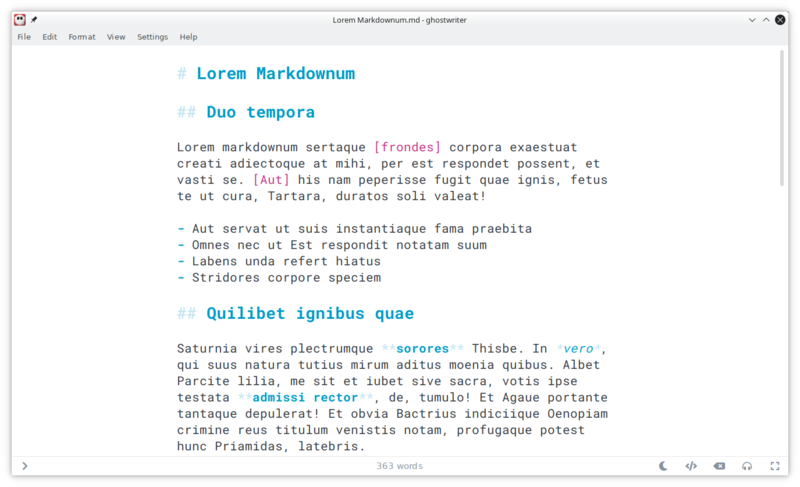 With Markdown, you can write now, and format later. 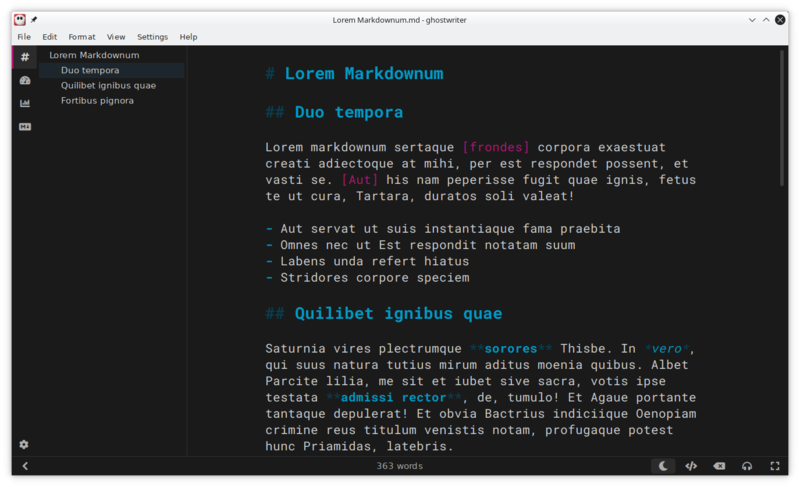 The built-in light and dark themes provide an aesthetic writing experience out of the box. 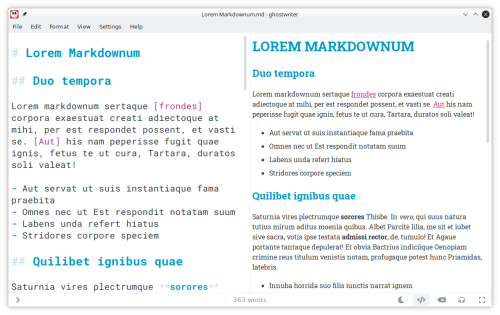 Preview your Markdown document in HTML. 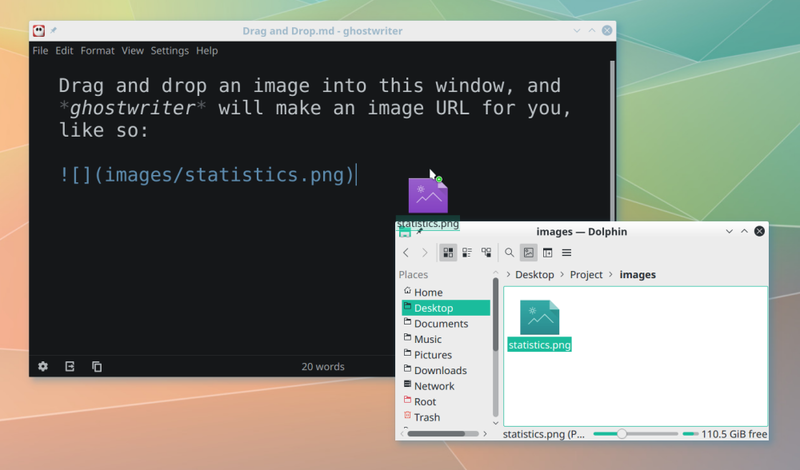 With the live preview, you can copy the HTML to paste into your blog, or export to another format. You can even set your own custom style sheet to see how your document will appear once it is posted on your website. The live preview is optimized for large documents, so you can work carefree without worrying about the application freezing while you type. ghostwriter will automatically detect their installation, allowing you to export to HTML, Word, ODT, PDF, and more! ghostwriter utilizes head-up displays (HUDs) to provide information and special actions. The Outline HUD facilitates navigating large documents. 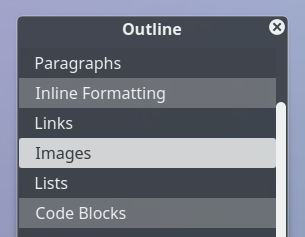 Simply click on a heading in the HUD to go to a different section of your document, including within the live preview. Clicking on the "Focus" button in the lower right corner of the editor will enable Focus Mode, which highlights only the current text around the cursor while fading the rest. 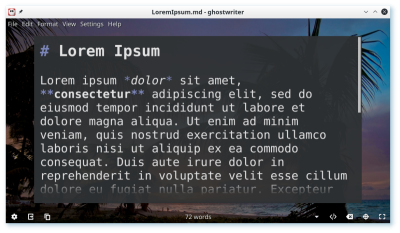 You can configure ghostwriter to highlight the current line, sentence, paragraph, or three lines. 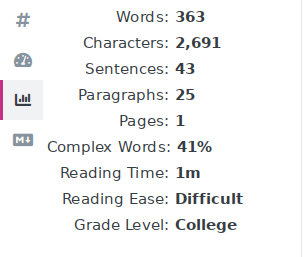 Clicking on the "Hemingway" button in the lower right corner of the editor will disable your backspace and delete keys, creating a typewriter experience. 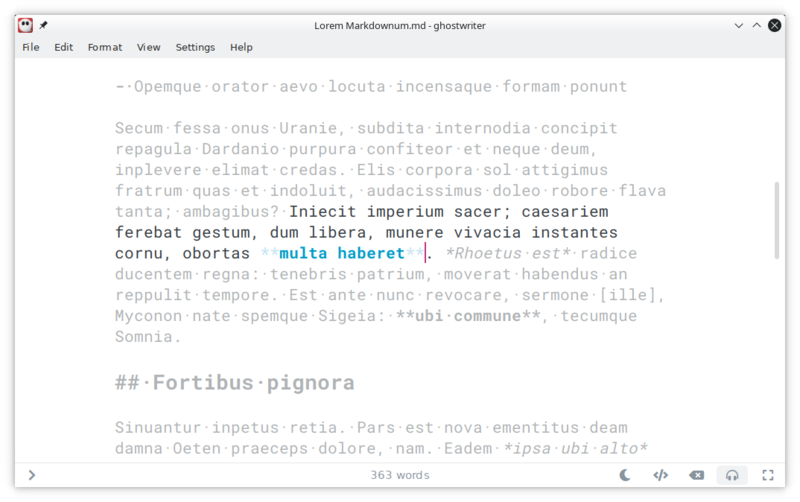 This feature is especially useful if you want to avoid editing and force yourself to write. If the two built-in themes are not enough, you can create your own! With background image support, you can create the ambience you need for your writing. 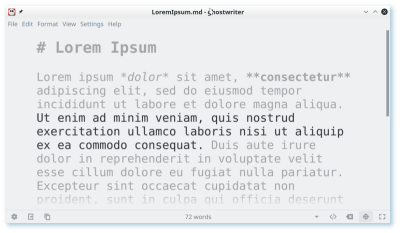 In addition to displaying a live word count at the bottom of the window, ghostwriter displays even more live statistics in its Document Statistics and Session Statistics HUDs. 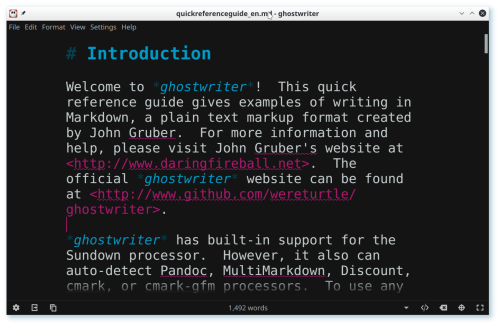 Easily create image URLs within your Markdown document by dragging and dropping an image from your file system into ghostwriter's editor. 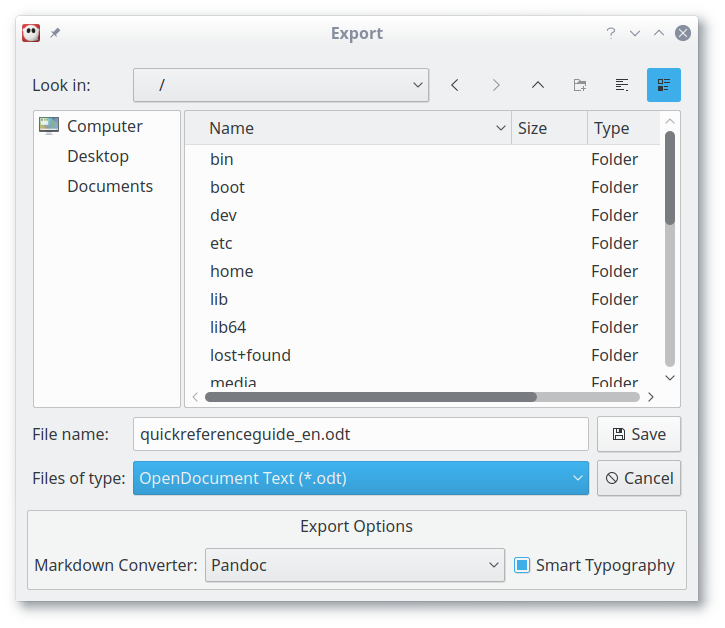 Over the years, I have greatly benefited from free and open source software. As such, I want to give something back to the community. Enjoy!